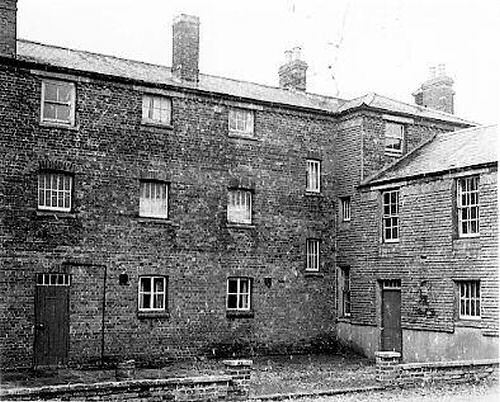 West Hanney set up a workhouse in around 1739, and Wantage from around 1741 (Hitchcock, 1985). A parliamentary report of 1776-7 listed workhouses in operation at Hampstead Norris (for up to 10 inmates) and Wantage (75 inmates). Berkshire: Aldworth, Ardington, Beedon, Blewbury, Bright Waltham, Catmere, Chaddlesworth, East Challow, West Challow, Charlton, Childrey, Chilton, Compton, Denchworth, Farnborough, Fawley, Goosey, Grove, Hamstead Norris (2), East Hanney, West Hanney, Harwell, East Hendred, West Hendred, East Ilsley, West Ilsley, Letcomb Bassett, Letcomb Regis, East Lockinge, West Lockinge, Peasemore, Sparsholt, Upton, Wantage (3). The population falling within the union at the 1831 census had been 15,917 with an average (1832-35) poor-rate expenditure of £15,120. 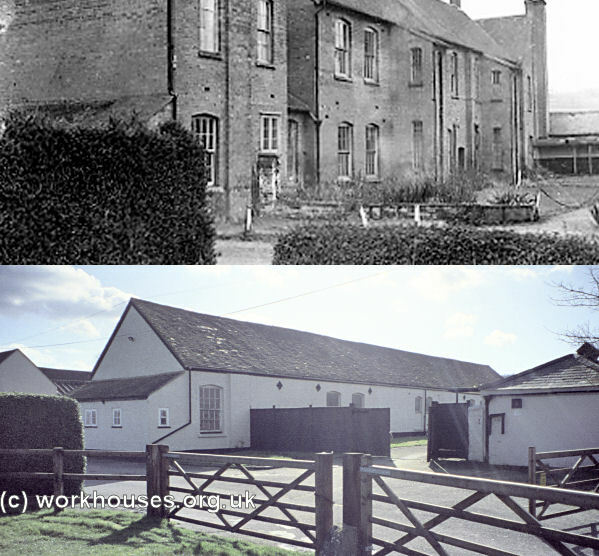 The new workhouse was built in 1836 on a site on the Hungerford road, 1.5 miles to the south of Wantage. 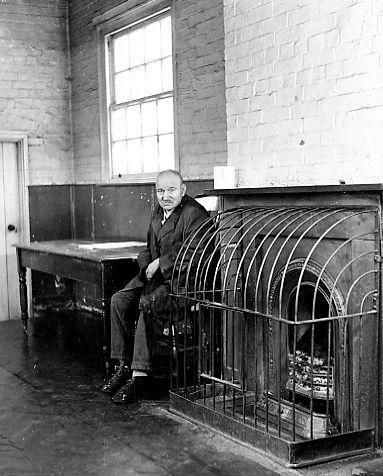 Its design, by Sampson Kempthorne, was for 230 inmates and cost £3,290. Its "square" layout can be seen on the OS map below. Kempthorne also designed several other the new workhouses in the area, for example hexagonal designs at Abingdon and Bradfield, and another square design at Newbury. In 1846, the construction of a workhouse chapel was proposed. Dedicated to St Michael, the building was constructed to the north of the main workhouse in 1849-50 to a design by Butterfield at a cost of just under £1,000. The original architect for the scheme was Gilbert Scott but his proposals seem to have been more expensive than the Guardians wanted. The chapel was around 80 feet in length, and able to accommodate the whole of the workhouse's inmates — it required the workhouse's stable block to be relocated in order to build it. The chapel was demolished in the 1940s after becoming unsafe. 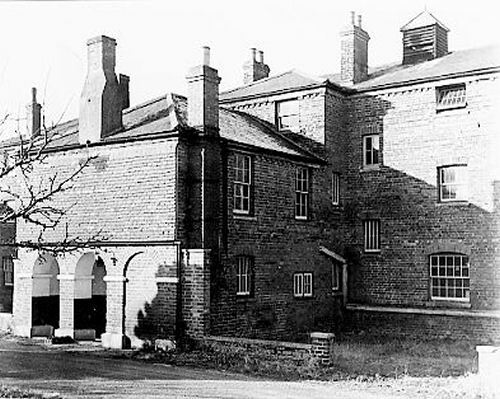 THE guardians of the poor of the Wantage Union, having determined to follow the example of the Boards throughout the country who have provided improved accommodation for the sick poor, have matured a scheme for pulling down certain old buildings at the back of the workhouse, and erecting an entirely new infirmary on the site. The new building will include ordinary and special sick-wards and day-rooms for both sexes, and lying-in ward. Lavatories, bathrooms, and other conveniences will be provided for all classes, and the building will contain most of the latest improvements of its kind. More accommodation for the pauper poor has long been needed in this union, which consists of thirty-four parishes, and embraces a large district. The outlay will be about 2,000l. Plans have been prepared by Mr. J. P. Spencer, architect, of Wantage; and, the Poor-law Board having already approved of them, tenders will be advertised for forthwith. 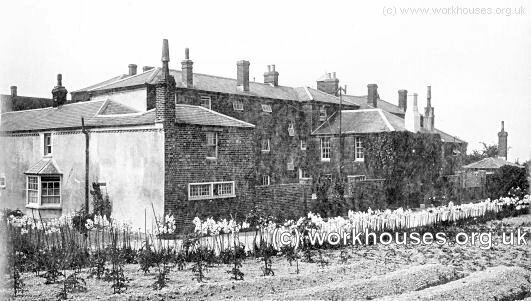 Wantage workhouse from the south-east, early 1900s. 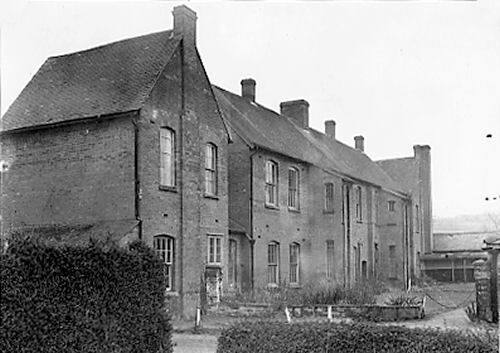 Wantage workhouse from the south-east, c.1922. After 1930, the workhouse was redesignated as a Public Assistance Institution, later becoming known as the Downs Hospital. Below are some views of the building from 1946. Wantage, south-east entrance from the east. Wantage, south-east range from the south. Wantage north-west range from driveway at the north. Since the closure of the Downs Hospital, the site has reverted to agricultural use. 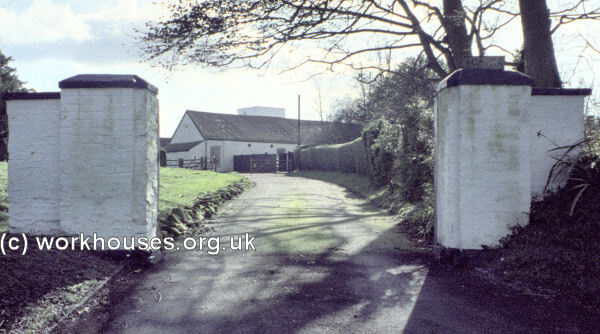 The old buildings have largely been demolished although parts of the ground floor have survived as single-storey stable buildings. The picture below shows a then-and-now comparison of the north-west range. Lower image © Peter Higginbotham, 2000. 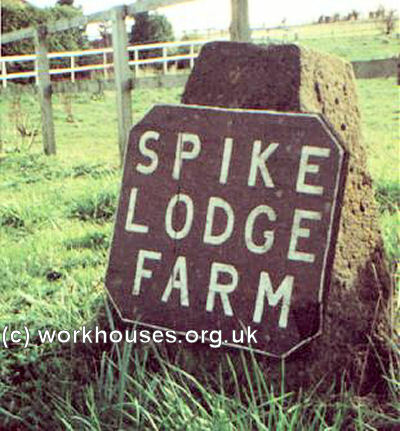 A final reminder of the workhouse days survives on an adjacent property named Spike Lodge Farm - the "Spike" was one of the old slang names for the workhouse. The Wantage Union operated a home for pauper children on Manor Road, Wantage. In 1911, the Master and Matron were Alfred and Emiley Beckley. 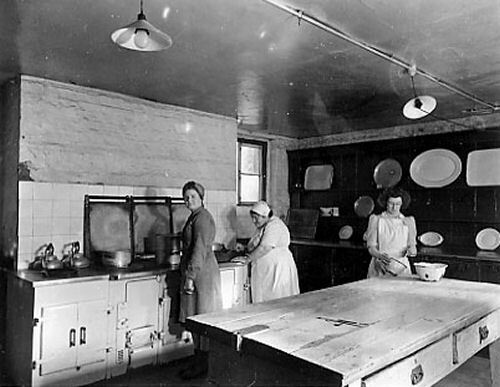 In their care were 16 boys and girls aged from 6 to 13 years. Berkshire Record Office, Berkshire Record Office, 9 Coley Avenue, Reading, Berks RG1 6AF. Holdings include: Guardians' minute books (1835-1930); Births (1836-1913); Deaths (1835-66); etc. The Builder , 9th October 1869. Thanks to Jane Knight for information on Wantage chapel.